All living things have a universal life energy, animals included. Reiki can be a holistic healing method that can help your family pet from suffering from stress, illness or emotional problems. 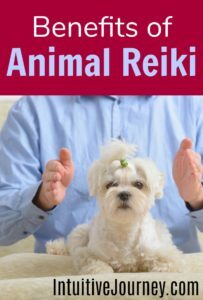 Someone that has been attuned to the Reiki art of healing can bring relief to humans, as well as animals, without using drugs. Reiki works on balancing the mental and emotional energies within the body. It is also a form of nourishment to our physical needs. Most people feel a sense of peace and spiritual growth when experiencing the hands-on treatment of Reiki. Animals are different from humans, but they know when a feeling of calm or bliss comes over them. It’s not uncommon for an animal’s response to Reiki energy to include relaxing, licking or chewing. The animal may also yawn, or possibly end up lying down. This is helpful in continuing a session. However, animals can refuse to accept this type of help. Care should be taken if an animal wishes to fight off the feeling. All animals, wild or tame, can be treated with Reiki. There is also no danger to the animal. Animals can sense when a dangerous or fearful situation is about to occur. Reiki only offers pleasing and calming movements by caring individuals. Behavioral issues are often difficult to cope with. These tendencies can be related to nervousness or hyperactivity. Reiki can help to address these inner-feelings by bringing balance to the nervous system. Injured animals are often scared of what has happened to them. Their impulse tells them to run or fight back. By using the Reiki technique, they are placed in a calm and trusting mood. Reiki healing can be learned by almost anyone. While laying hands on the affected area is beneficial in passing life energy, distance healing can also be acquired. Watching a pet suffer is almost too great to bear when you have grown up with them as part of your family. Bringing them aid without harm, pain, or fear of the unknown is a truly beneficial way to treat your pet humanely. If you liked this pin, I’d love for you to Pin It! Does Reiki Distant Healing Really Work?